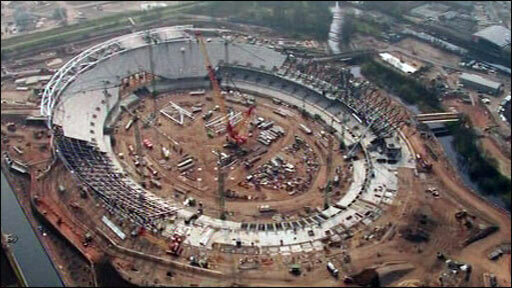 Preparations for the 2012 London Games are on time and on budget, the International Olympic Committee (IOC) has said. IOC inspectors, who finished a three-day visit to London on Thursday, said the preparations were "impressive" and unaffected by the recession. But chairman Denis Oswald said attention to ticket allocation would avoid empty seats at venues. The delegation checked the "big five" Olympic venues. These are the Aquatics Centre, Olympic Village, Olympic Stadium, the Velodrome and the IBC/MPC, a mixture of permanent and temporary buildings - based in Stratford, east London. Mr Oswald told a news conference in London: "We can confirm that London 2012 is on the right track. "We know the world is going through a difficult time but Locog (London Organising Committee of the Olympic Games) had a very strong commercial policy from the beginning and have been able to secure a high amount of sponsorship before the crisis came and have reached £0.5bn." 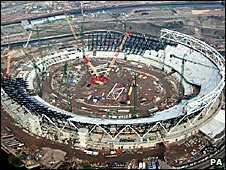 He said inspectors were "deeply impressed" by the progress made in the construction, and said that the stadium, the Olympic Village and the swimming pool were also impressive. He also said it was important that the Games' ticketing policy was given attention so that it did not suffer the same mistake as Beijing did regarding empty seats. Locog has raised nearly £500m from the private sector towards its £2bn budget to stage the Games. Mr Oswald said it was "important" that the Government had put money into the Olympic Village from the contingency fund so that construction work was not delayed. Paul Deighton, Locog chief executive, said there were no concerns about the use of the contingency and that only a "small proportion" of it had been used. He said: "It would be extraordinary if the contingency funds were not used. It is precisely the purpose that the Chancellor put it in place." Mr Oswald said he might now give London marks that are "very close to 10" for its preparations.